Khachapuri, a classic recipe of Caucasian cuisine, has a huge number of varieties and variations. 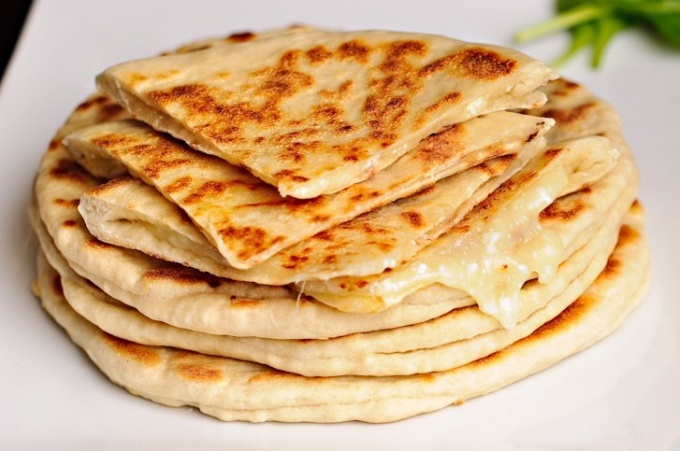 Initially, the Georgian language the name of the dish translates as "bread with cheese", but at the moment khachapuri is cooked with different fillings. Khachapuri – a classic dish, but the recipes of cooking in Georgia, there are over 30 (and in addition there are Georgian khachapuri, Ossetian, Kabardin, and other versions of this lovely dish). The original translation of the word "khachapuri" meant "dough with cheese", but in different regions of Georgia, decided to put in the tarts of this kind of cheese, fish, meat, greens etc. in addition to filling in khachapuri can be used in different dough (yeast, nekozawa, puff), and may change the method of cooking (pies can be fried or baked in the oven or in the oven). In one of the most common Russian recipes kebab acharuli or as a filling is used Imeretian cheese (soft cow's cheese aged in brine), butter and eggs. As this is an open pies, egg not just the flavor, but also decorate the boat. Traditionally, the egg in Ajarian khachapuri added to the end of baking, the yolk is still watery, so it could dip pieces of dough. In another fairly well-known recipe closed khachapuri Megrelian khachapuri, named for a region in Georgia, where they came from this recipe, the stuffing is cheese Suluguni, butter and finely chopped herbs (dill, cilantro, parsley). In the absence of Suluguni cheese you can use feta cheese or Imeretian cheese. In the region of Svaneti khachapuri, usually made with finely chopped meat (beef, lamb), ground black pepper, Khmeli-suneli and any greens available in the house. Svan khachapuri of the closed type are most reminiscent of classic pies. Video Rachinski can be of two types: traditional (with a young salty cheese) and lobiani. Classic hacharoi rachyntsi sprinkle of ground lentils (previously also sprinkled with grains of cannabis). In lobiani filling is boiled beans with spices, smoked meat and herbs. Lobiani is made in the form of boats closed. Despite the canons of the recipe, now cook a khachapuri with such toppings as fried mushrooms, chicken fillet, cheese, tomato and herbs, mashed potatoes with herbs, egg and onion. Widely known Ossetian pies, which is a variation on the theme of Georgian khachapuri, can be prepared with minced meat, spinach and regular cheese any available home varieties.